The migration to Microsoft Office 365 is well under way for most enterprises. But the user experience will determine whether or not the move to Office 365 will be considered a success. 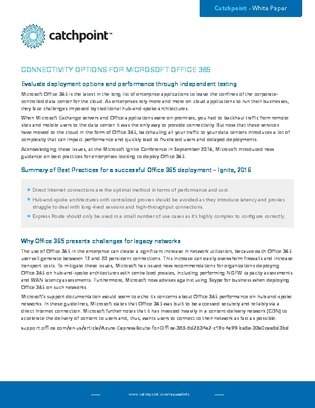 In light of Microsoft's latest guidance for deployment, enterprises need to adapt their current hub-and-spoke architectures and route Office 365 traffic locally to the Internet. This report investigates 2 approaches for routing traffic locally – going direct and using the Zscaler Cloud Security Platform – and the impact they have on the user experience.